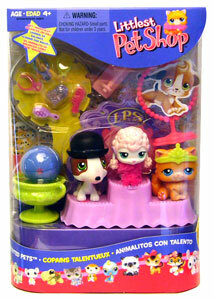 Description Of Item: The Littlest Pet Show is about to begin! The pets have been preparing for the big event all week, practicing their tricks and hoping to win first prize. Who will be named Best in Show? These three pets are ready to compete for Best in Show or maybe just to see who can have the most fun! Place a pet on the ball and it ?magically? balances on top! Three exclusive pets come with lots of fun accessories.